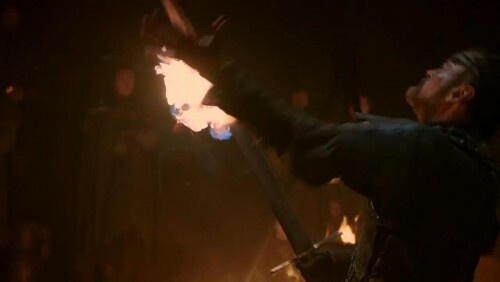 It’s always a pleasure to interview writer and story editor Bryan Cogman, who has so far written an episode of each season, including what are amounting to two of our personal favorites of the series: “What is Dead May Never Die” and his season three episode, “Kissed by Fire”. Below, I talk with Bryan about the episode, the introduction of new characters, his proudest moments, and much more. It’s a lengthy one but, we hope, a good one. Enjoy! All right, thanks so much for taking the time, first off! Now, often episodes seem to have their titles decided at the last minute—George’s episode went through a couple of different names before it was settled. Was “Kissed by Fire” always the title you preferred for your episode? It does! A lot of effort seems to go into finding just the right title for each episode. It’s not necessarily a straightforward process. Really? “Valar Dohaeris” seems such a compliment to “Valar Morghulis”, as a title. A scene quite a few were looking forward to. Nice surprise for the readers. Now, your episode of course has the Beric and Sandor fight. In fact, it starts with it. I thought that was an interesting decision, in and of itself, starting with that action beat. Was it always the intention of having it there at the start? I thought that was quite effective. It also, it seemed to me, helped ease through a transition from Daenerys’s big moment at the end of the prior episode, which caused so much excitement. It can be hard to follow up something like that, but I think this fight did it, and the performances that went with it. Great work all around. Definitely a highlight of the season so far, in my opinion. Pretty much exactly how I imagined it should be. One always asks if it’s embarrassing or awkward for actors to perform a love scene—but how is it as a writer, writing it and knowing that these colleagues and friends of yours will be performing whatever it is you put down on the page? I imagine this was a set too, right? That sort of internal waterfall made me wonder a bit, it looked so natural. The set construction always was and remains impressive. Another set we revisit is Harrenhal, as Jaime and Brienne arrives. This one’s more for the book readers… but in the novel, of course, Roose Bolton seems genuinely annoyed by Vargo Hoat taking off Jaime’s hand, but he’s in an awkward position with Hoat and his men—they’re fairly independent of him, and Hoat has big ambitions. On the show, Locke carries out the same sort of action, but he seems to have some different motivation behind it—he’s not angling to get a big ransom from Tywin, or the lordship of Harrenhal, I think. What sort of motives does Locke have, in contrast to Hoat? Part of it is that it’s not exactly clear what his status is. Is he a hired sellsword, or a sworn man of Bolton’s, etc. That sort of thing. Ah, interesting. I’ve enjoyed Noah Taylor’s performance. Comes across as quite a nasty piece of work. Hopefully we’ll be seeing more of him. Me too! A film I’ve noticed I’m happy to rewatch with some regularity. Cameron Crowe at his best. Of course! That moment of catharsis you spoke of, it really is such a central moment for Jaime. I’m so glad it came out so well. Nikolaj’s performance was something else. Were you on set for it? Yes, I recall Nikolaj saying as much. Absolutely worth it. I think it’s one of George’s finest moments in the novel, too, that scene. The atmosphere, the emotion, the interplay between the two characters. Jaime is the dark mirror to what Brienne holds dear—everything looks twisted up and corrupted in him, but now she sees why it happened. I thought that was a very strong moment, too. They’re both killing it this season. I’ve said it early on, and I’m standing by it—I think this is going to be remembered as Jaime’s and Brienne’s season, when all is said and done. We’ll have to see what the future brings… I also thought it was very smart to finish on “Jaime. My name is Jaime.” As I recall, Jaime just thinks that, and you could have just left it out. Leaving it in seemed to me to underscore a really central theme, the problem of identity. Turning to Riverrun, Rickard Karstark’s treason, and Robb’s judgment, came out quite well. I mean, I’ll be saying this a lot about this episode, because a lot really did come out quite well. I was going to ask something about the Blackfish, but will skip that for a moment, since you brought up the execution. There’s a small change from the novel, besides the sword-axe thing, namely the fact that in the book… well, it’s not a pretty death. 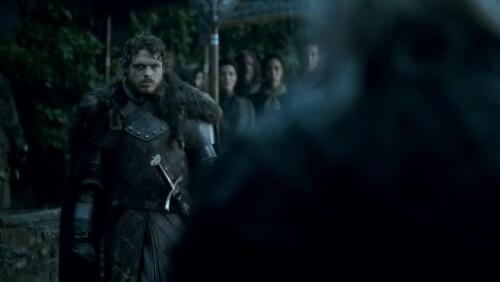 Robb kills him with the first blow, but it takes several more to actually take his head off, and there’s something about Robb being drenched in blood by the end of it. Which, it seems to me, would echo the ugliness of Theon’s botched attempt at executing a man. Was that a deliberate change, or just a time thing? Definitely marks a difference between them on the show. Now, the Blackfish. I think it’s great that he’s in, and I admit I was actually a bit surprised that he was cast. I thought for sure he was going to be cut because, while he’s a character who makes an impression, he’s not necessarily critical to anything. He does give characters like Catelyn and Edmure and Robb some important feedback, but I gather that he’s taken on a bit of the Greatjon as well. Is that right, or am I just seeing things? Another thing that he’s gotten is ... gosh, he sure doesn’t like his nephew, basically. Tobias Menzies is very, very good at that pained, put-upon look. I feel sorry for him. But I felt sorry for his Brutus, too. Casting’s gone quite well this season for the most part, I think. Of course, this episode also—perhaps surprisingly—introduces two brand new characters into the story, Selyse and Shireen, played by Tara Fitzgerald and Kerry Ingram. When was it decided that they were finally going to appear? Well, you had a stand-in for Selyse in the opening of S2, and I think Melisandre makes a passing reference to her, but this is quite a bump up in visibility. 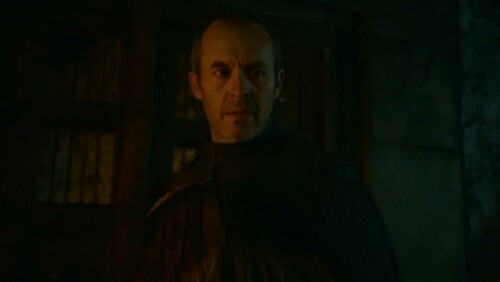 I find many of the “Stannis the Mannis” fans have a superhuman picture of Stannis that isn’t really what’s in the text. Yep. I thought makeup and such—and performance, too—really sell that he’s quite a bit wearier. He looks a bit older, even. It’s a bit like he can’t think of anything better to do than to socialize with his family, too. I thought it emphasizes his lack of connection to them except in a notional way pretty well. I was going to ask about where that particular image of the stillborn children came from. That makes sense. “Yes, the three babies came to me in state of half-sleep. I often wake up thinking about scenes I’m writing. The writer’s life—you’re never off the clock, even when you’re asleep! How morbid. Fitzgerald does a great job, another terrific addition to the cast. The moment when you realize that she’s fully aware of and in support of the infidelity was very good. Her zealotry runs so deep that she doesn’t feel shame or anger over something that’s obviously so insulting. A very unhealthy family relationship, all around. Poor Shireen. If Selyse is for Melisandre… in a way, Shireen is for Davos. I thought it was a really good idea to give them more of a personal connection, especially as Edric Storm isn’t around. Liam’s one of my favorites on the show, he does all these personal scenes so well. Really imbues them with a sense of a real person living a real life, with real relationships. You know, thinking along that line was one thing that made me think it might have been interesting having Catelyn interact with young, doomed Willem and Martyn a bit. Going back to Shireen for a bit… we get Patchface’s song in, too, with Shireen singing it. Should we take it that she learned that from him, or is it something she’s made up herself? When was it decided to record the song and put the whole thing over the credits? Wonderfully creepy touch. Moving across the narrow sea for a little bit, the Jorah and Barristan scene was interesting in a couple of ways. First, it introduces a new tension—Jorah now feels threatend by Barristan’s presence, in terms of influencing Daenerys. But I also detected an undercurrent of something else—like he was fishing for information about just what Barristan knew about him and his dealings with Varys. Hence the change of not having Barristan on the small council. I actually thought it was a nice touch having her sort of riding around in the background. There’s a whole army there, she’s not always hanging out with Jorah and Barristan. And obviously, they introduced Gray Worm, too. That’s three new characters introduced half way into the season. That may be a first for the show. What’s up with Loras getting his head turned, and so quickly? “When the sun has set, no candle can replace it,” was a line I was really hoping to hear. It’s such a naively romantic thing, the intensity of young love and all. It also sort of sticks him into the same general position of Sansa, as this character who has this idealistic, romantic image of things. (It’s even funnier when you consider that Littlefinger, too, is a romantic, but a twisted version of one.) A lot of characters are actually romantics, though, in the novels. It’s a current that runs through a lot of George’s work. True. Though you then have the Bluray, with the cut scene (as one of those bloody dragon eggs! ), where you can see how he blames himself and it wasn’t really anything like he wanted. It does nicely set up Littlefinger going to Sansa and ... testing her? Testing his theory that she’s the intended? It was a nice way to wrap that up. Or, I should say, lead us to the wrap up. 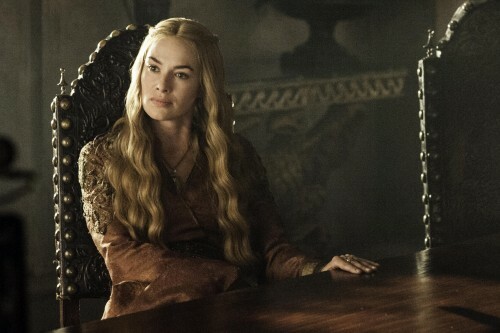 And speaking of Cersei…. To wrap up, lets talk about that last scene, that climactic moment around a table, of all things. I did love Lena’s smirking through all that. Of course Cersei would feel a great deal of schadenfreude, and of course she couldn’t contain herself. Until, of course, she got that rude surprise. Which means it’s been decided that Loras and Margaery are the only children of Lord Tyrell, I take it? No Garlan or Willas? There’s another change I thought which was interesting. You flipped the order around on the revelations. In the book, Cersei’s informed first that she’s being put back on the auction block, so to speak, to make a political marriage, and then Tyrion learns of Tywin’s plan to marry him to Sansa. Did you feel, in writing the scene, that it flowed better by having it the other way around? For one thing, it allowed that gleeful Cersei to last quite a bit longer. Maybe that was reason enough. Pulling the rug out from under Cersei must be quite fun. All right, I think that may be an excellent point to stop. Thanks again, Bryan!